CAMBRIDGE – Following 15 years of hype, a new conventional wisdom has taken hold: emerging markets are in deep trouble. Many analysts had extrapolated rapid growth in countries such as Brazil, Russia, Turkey, and India into the indefinite future, calling them the new engines of the world economy. Now growth is down in almost all of them, and investors are pulling their money out – prompted in part by the expectation that the US Federal Reserve will raise interest rates in September. Their currencies have tumbled, while corruption scandals and other political difficulties have overwhelmed the economic narrative in places like Brazil and Turkey. With hindsight, it has become clear that there was in fact no coherent growth story for most emerging markets. Scratch the surface, and you found high growth rates driven not by productive transformation but by domestic demand, in turn fueled by temporary commodity booms and unsustainable levels of public or, more often, private borrowing. Yes, there are plenty of world-class firms in emerging markets, and the expansion of the middle-class is unmistakable. But only a tiny share of these economies’ labor is employed in productive enterprises, while informal, unproductive firms absorb the rest. Compare this with the experience of the few countries that did emerge successfully, “graduating” to advanced-country status, and you can see the missing ingredient. South Korea and Taiwan grew on the back of rapid industrialization. As South Korean and Taiwanese peasants became factory workers, the economies of both countries – and, with a lag, their politics – were transformed. South Korea and Taiwan eventually became rich democracies. By contrast, most of today’s emerging markets are deindustrializing prematurely. Services are not tradable to the same extent as manufactured goods, and for the most part do not exhibit the same technological dynamism. As a result, services have proved to be a poor substitute to export-oriented industrialization so far. But emerging markets do not deserve the doom-and-gloom treatment they are getting these days. The real lesson from the collapse of the emerging-market hype is the need to pay closer attention to growth fundamentals and to recognize the diversity of circumstances among a group of economies needlessly lumped together. For developing economies, the three key growth fundamentals are acquisition of skills and education by the workforce; improvement of institutions and governance; and structural transformation from low-productivity to high-productivity activities (as typified by industrialization). East Asian-style rapid growth has typically required a heavy dose of structural transformation for a number of decades, with steady progress on education and institutions providing the longer-term underpinnings of convergence with advanced economies. Unlike East Asian economies, today’s emerging markets cannot rely on export surpluses in manufactures as their engine of structural transformation and growth. So they are forced to rely more on the longer-term fundamentals of education and institutions. These do generate growth – and indeed are ultimately indispensable to it. But they generate 2-3% annual growth at best, not East Asia’s 7-8% rates. Compare China and India. China grew by building factories and filling them with peasants who had little education, which generated an instant boost in productivity. India’s comparative advantage lies in relatively skill-intensive services – such as information technology – which can absorb no more than a tiny slice of the country’s largely unskilled labor force. It will take many decades for the average skill level in India to rise to the point that it can pull the economy’s overall productivity significantly higher. So India’s medium-term growth potential lies well below that of China in recent decades. A significant boost in infrastructure spending and policy reforms can make a difference, but it cannot close the gap. On the other hand, being the tortoise rather than the hare in the growth race can be an advantage. Countries that rely on steady, economy-wide accumulation of skills and improved governance may not grow as fast, but they may be more stable, less prone to crises, and more likely to converge with advanced countries eventually. China’s economic achievements are undeniable. But it remains an authoritarian country where the Communist Party retains its political monopoly. So the challenges of political and institutional transformation are immeasurably greater than in India. The uncertainty that confronts a long-term investor in China is correspondingly higher. Or compare Brazil with other emerging markets. Among these countries, Brazil has arguably taken the greatest hit recently. The corruption scandal surrounding the flagship state-owned oil company, Petrobras, has produced an economic crisis, with the currency tanking and growth grinding to a halt. Yet Brazil’s political crisis demonstrates the country’s democratic maturity, and arguably is a sign of strength rather than weakness. The ability of prosecutors to investigate payment irregularities reaching into the highest ranks of Brazilian society and government without political interference – or the process turning into a witch hunt – would be exemplary in many advanced countries. The contrast with Turkey could not be more striking. Corruption of a much greater magnitude there, implicating President Recep Tayyip Erdoğan and his family, has gone untouched. A probe by Turkish prosecutors against Erdoğan in 2013 was clearly politically motivated (and driven by Erdoğan’s foes in the movement headed by Fethullah Gülen, a self-exiled Islamic preacher), which gave the government the cover needed to quash the investigation. Turkey’s economy has not suffered nearly as much as Brazil’s, but its rot will cause greater long-term damage. Cheap external finance, plentiful capital inflows, and commodity booms helped hide many such shortcomings and fueled 15 years of emerging-market growth. As the world economy generates stronger headwinds in the years ahead, it will become easier to distinguish countries that have truly strengthened their economic and political fundamentals from those that have coasted on false narratives and the tenuous strength of fickle investor sentiment. How Far from Normal are We? As I have mentioned, I have been hard at work on my book and am approaching completion of the raw manuscript. The title of the book is What's Wrong with Money? : The Biggest Bubble of All - and How to Invest with it in Mind, and if you would like to be on the notification list to receive an email when the book is published, simply send an email to WWWM@enduringinvestments.com. Even better, you can pre-order it already, even though it's not due out until later this year or early next year. If a length of steel is flexed, it is impossible to know exactly when it will fail. We can, however, figure out when that critical point is approaching, and estimate the probabilities of structural failure for a given load. These are just probabilities, and of course such an estimate depends on our knowledge of the structural properties of the piece of steel. With economies and financial markets, the science has not yet advanced enough for us to say that we know the "structural properties" of economies and markets. And yet, we can measure the stress markets are under by measuring departures from normalcy and make observations about the degree of risk. Didier Sornette wrote a book in 2003 called Why Stock Markets Crash: Critical Events in Complex Financial Systems. It is a terrific read for anyone interested in studying these questions and exploring the developing science of critical points in financial markets. His work goes a long way towards explaining why it is so easy to identify a bubble and yet so hard to predict the timing of its demise. So in that spirit, let us look at a few pictures that illuminate the degree of "departures from normalcy" in which economies and markets currently are. Figure 9.6 shows the nice relationship between the increase in GDP-adjusted money supply (M/Q from Figure 3.1) and the increase in the price level (P) over the nice, regular, period between 1962 and 1992. I've added to this plot a dot representing the latest ten year period, and (for fun) a dot representing the ten years ending in the heat of the stock market bubble in 1999. Do we appear to be out of normalcy? Figure 9.7 shows the relationship between stocks and spot commodity prices, as represented by the S&P 500 and the Bloomberg Commodity Index. The curve is from 1991 to 2007, excluding the period around the equity bubble (1998-2002). The two dots show the current point, and the point from December 1999. Do we appear out of normalcy? Let's try one more. Figure 9.8 shows the same commodity index, but this time against the money supply. It makes sense that spot commodity over time should move more or less in relation to the aggregate amount of money in circulation. The relative prices of two items are at least somewhat related to their relative scarcities. We will trade a lot of sand for one diamond, because there's a lot of sand and very few diamonds. But if diamonds suddenly rained down from the sky for some reason, the price of diamonds relative to sand would plummet. We would see this as a decline in the dollar price of diamonds relative to the dollar price of sand, which would presumably be stable, but the dollar in such a case plays only the role of a "unit of account" to compare these two assets. The price of diamonds falls, in dollars, because there are lots more diamonds and no change in the amount of dollars. But if the positions were reversed, and there were lots more dollars, then the price of dollars should fall relative to the price of diamonds. In this case, dollars have been raining from the sky and yet their price relative to commodities has not fallen - that is, the nominal price of commodities has not risen, as we would have expected. Figure 9.8 shows that the price of money, relative to hard assets like physical commodities, may be in the greatest bubble it has ever been in. And since, unlike stocks and unlike real estate, everybody holds money, this may be the biggest bubble of them all. All three of these figures - and I could have chosen many others - show a highly-flexed economy and highly-flexed markets. A break in this steel bar is almost assured; the only question is when. Moreover, while we hear so much today about the "coming deflationary depression," I have to say that with the quantity of reserves in the system and the direction in which the monetary pictures are flexed, there is in my opinion as much chance of a deflationary outcome as I have of being appointed Prime Minister of Egypt. TODAY’S figures for GDP in the second quarter of 2015 from Eurostat are disappointing. The consensus among economists was that the 19-strong currency club would grow by 0.4%, the same as in the first quarter. Instead the pace of quarterly growth slowed a little, to 0.3%, leaving output 1.2% higher than a year ago. The French outcome was the main setback. Output had been expected to rise by 0.2% following growth of 0.7% (revised up from 0.6%) in the first quarter. Instead it stagnated mainly because of an abrupt slowdown in consumer spending. Italian GDP continued to expand but by 0.2% compared with 0.3% in the first quarter, leaving output only 0.5% higher than a year ago. The feeble economic performance of France and Italy is the principal reason why the overall recovery of the euro area since the spring of 2013 has been a pallid affair. Given the stimulus from lower energy prices and the policy of quantitative easing (purchasing assets by creating money) pursued by the European Central Bank (ECB) since March, the renewed weakness in the euro zone’s second- and third-biggest economies is troubling. 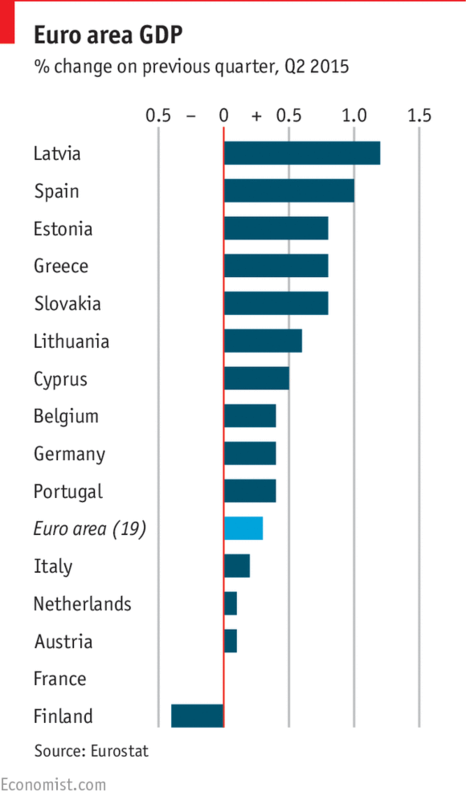 Their unsatisfactory performance contrasts with the strong upswing in the Spanish economy, the fourth-biggest in the euro area. The pace of quarterly growth strengthened from an already robust 0.9% in the first quarter to 1.0% in the second quarter, among the highest in the euro area. The reasons why Spain is now doing so well are disputed. Some point to the benefits of structural reforms made in the past three years (which Italy and France have lagged in introducing) while others emphasise the wrenching internal adjustments made by workers and businesses together with the cathartic effect of sorting out the banks in 2012. An oddity is that despite the intense liquidity squeeze of the past few months in Greece, where the banks have been unable to lend and the government stopped paying commercial creditors, GDP is estimated to have grown by 0.8% in the spring. Statisticians have also revised up their estimates for previous quarters, from minus 0.4% to minus 0.2% in the final three months of 2014, and from minus 0.2% to zero in the first quarter of 2015. One reason for the strong outcome in the second quarter might be that Greeks fearing for what might happen to their euros in the event of a “Grexit” and the reinstatement of the drachma (which would immediately tumble in value) spent some of the cash they withdrew from bank accounts on consumer durables such as cars, regarding these as safer forms of wealth. Whatever the precise cause (and the estimate may in any case be revised down), the outlook for the Greek economy remains bleak owing to the trauma of late June and July when the banks were closed for three weeks and capital controls were introduced. As so often before, a solid performance by Germany, the hub economy within the euro area, has bolstered euro-zone growth. German output expanded by 0.4%, a bit higher than in the first quarter when it grew by 0.3%, though lower than the consensus forecast of 0.5%. Although the pace of growth was still satisfactory a worry is that exporters are bound to be hurt by the weakening Chinese economy, a prime market for German investment goods and luxury cars. A year ago, the first estimate for GDP in the second quarter was a wake-up call for the ECB because it showed a stalled economy only a year after a feeble recovery had begun. Subsequent revisions have turned that ominous zero into growth of 0.1% as well as raising GDP growth at the start of the recovery, in the second quarter of 2013, and in the final quarter of 2014, from 0.3% to 0.4%. The estimates published today are only the first draft of economic history and may also be revised up. But the broader picture is that the euro-zone recovery, while intact, lacks vigour to a worrying extent. 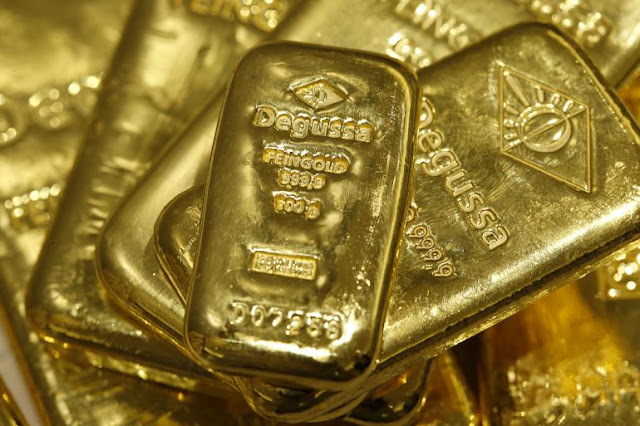 The precious metals sector has held recent lows and a rebound is underway. Gold held $1080/oz for three straight weeks and has pushed as high as $1126/oz this week. The gold miners (GDX and GDXJ) surged the first half of the week and Silver has also gained. We believe that this move is more likely to be a relief rally before Gold ultimately tests $1000/oz rather than the start of a new bull market. Gold's weekly candle chart is posted below and at the bottom it includes the net speculative position in Gold. Over the past two weeks Gold's net speculative position was the lowest in 14 years! Gold pushed through $1100/oz this week after forming hammers during each of the prior three weeks. The near term upside target remains $1140-$1150/oz while near term support is $1100/oz. The gold miners surged at the start of the week. Through Wednesday GDX gained 14% while GDXJ gained 17%. Despite Thursday's sharp reversal, the miners have further near term upside potential. If this rebound has legs then look for GDXJ to test $23-$24 and GDX to test $17. In recent weeks and months we have posted a handful of charts showing how cheap and depressed the gold miners are. We have a new one to share. Using the Barron's Gold Mining Index (BGMI) we see that gold stocks relative to the S&P 500 (as of last week) were trading within 2% of the all-time low in 2000. This could be a major double bottom. Though we believe the bear market is not quite over as we think Gold could test $1000/oz, there is an important distinction to make. As of last week the gold stocks to Gold ratio was also trading at all time lows. The gold stocks are not only extremely oversold but historically oversold. The BGMI as of last week was trading at a 13-year low and at the same level as 42 years ago! Simply put, Gold is nowhere near as oversold as the gold mining stocks. Therefore it is possible the gold stocks could bottom before Gold. Recall, this happened during the 2000-2001 lows. That being said, we will keep all scenarios open and trade accordingly. Be aware of the risk of a Gold reversal at $1140 to $1150 and the risk of a future test $1000/oz. At the same time, consider the historic oversold condition in the gold stocks. I would not be surprised to see the juniors (GDXJ, GLDX) start outperforming Gold before Gold bottoms.